When you first install Novell Filr, the Filr administrator username is admin and the password is admin. When you first log in to the Filr site as the administrator, you should change the administrator password from the default password to a secure password of your own choosing. Depending on how you have configured your Filr system, you may not be required to enter the port number in the URL, and if you are using NetIQ Access Manager, the Filr login screen is not used. For more information about Filr configurations that affect login, see Network Configuration and Changing Reverse Proxy Configuration Settings in the Novell Filr 1.0.1 Installation and Configuration Guide. 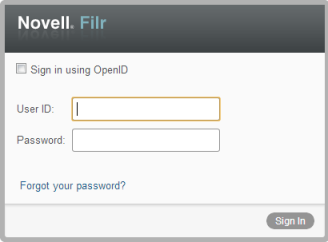 The Change Password dialog box is automatically displayed when you first log in to the Filr site. Change the default administrator password to a secure password. In the Change Password dialog box, type the admin in the Current password field, then go to the New password and Confirm new password fields and specify a new password.